Mackinaw Island Fishing Charters: Mackinaw Island is a very popular tourist destination, and offers a wide variety of fishing opportunities. 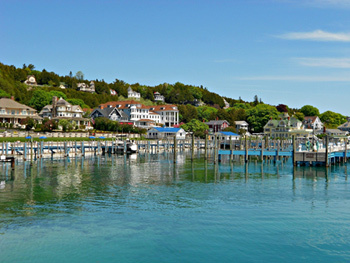 We are happy to design custom charter packages that include customer drop-off or pick-up on Mackinaw Island. Mackinaw Island features dramatic underwater structure, and we often fish in front of scenic Arch Rock and the historic Grand Hotel. The deep water shipping channel directly under the Mackinaw Bridge is often an excellent place to find bait fish and active King Salmon, and is another favorite fishing spot for the Diabolical.